Legal support by Barnes & Thornburg from Chicago / USA. Barnes & Thornburg LLP has a strong regional, national, and international practice and a broad and diverse client base. The firm is a member of TerraLex, a large, worldwide network of leading independent law firms, and the TechLaw Group, a network of independent regional law firms serving the technology market. 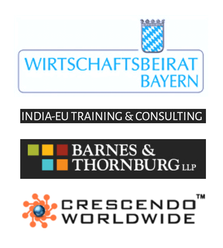 Marketing Know-How from Crescendo Worldwide in Pune, India: Crescendo Worldwide is an International Trade Generating Organization based in India, with presence in 18 countries. Crescendo Worldwide is looked upon as a preferred organization for companies who are looking for International business expansion. A great worldwide support network by Wirtschaftsbeirat Bayern (Economic Advisory Board). The Wirtschaftsbeirat Bayern represents the interests of the entire economy and offers a forum for a constructive cooperation of all social forces. They conduct the dialogue between business and politics at all levels on important topical, economic topics in larger lecture and discussion events, but also in smaller discussion groups and working groups as well as in direct discussions with personalities from politics, science and administration. All of them provide Expandeers with yet more expertise and in-depth support for our clients.